An Honorary Citizen of L'vov. 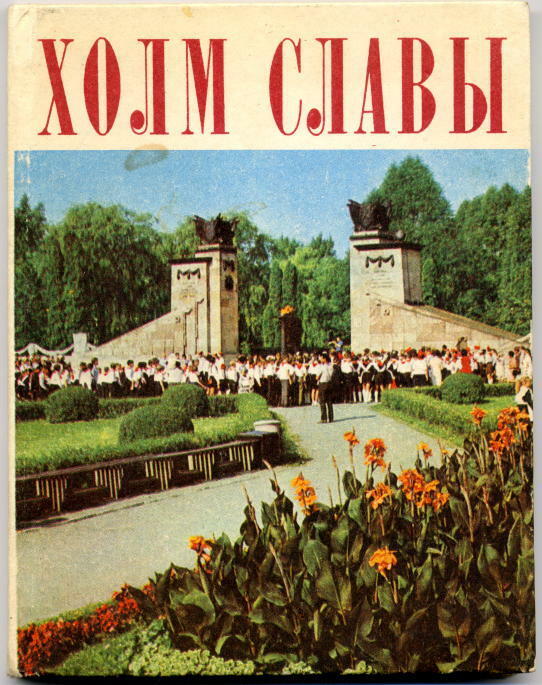 In 1964 the city of L'vov's Council of Workers' Deputies marked the 20th anniversary of the liberation from Hitler's forces by establishing "The Book of Honorary City Citizens." The first name was that of guards tanker Sergeant-Major Aleksandr Porfir'evich Marchenko, who on 23 July 1944 raised the red flag over city hall. Every year on 27 July in honor of A.P. Marchenko and all the soldiers who fell in the fighting to liberate L'vov, the local garrison's best soldier and the most outstanding representative of communist labor raise the USSR flag on the tower of the city council building. The first to be privileged to carry out this honor were Hero of the Soviet Union F.P. Surkov and T.F. Novak. On the eve of the 25th anniversary of the city's liberation the Chervonoarmeisk regional committee and the district executive committee of workers deputies decreed a "Day to commemorate Marchenko Street." On Building No. 1 on this street a memorial plaque was affixed that tells of this guards tanker's deeds. On 31 August 1973 the workers of L'vov commemorated the 60th anniversary of Aleksandr Marchenko. The holiday began with a formation of Young Pioneers on the Hill of Glory. To the loud applause of the festively attired pioneers, Hero of the Soviet Union V.M. Gopnik used the eternal flame to light a torch that was brought in an armored personnel carrier to Lipovaya Boulevard, from where in July of 1944 the tank "Guards" began its legendary raid. The city's best athletes then took up the burning torch and brought it along the heroic route to Market Square and the municipal council building. The running torchbearers were accompanied by soldiers of the L'vov garrison in armored personnel carriers and sports motorcyclists. A large crowd met at the municipal council building, and the day of the guards tanker was concluded by a ceremonial session in the Chervonoarmeisk district party committee's building. These were the honors earned by a plain Soviet fighting man. But how did he come to perform his heroic deeds? Aleksandr Marchenko was born in 1913 in the town of Glukhov in Sumy District. His father, Porfirii Alekseevich, was a skilled stoneworker who had come to Glukhov from the Don region before the first Russian revolution [of 1905]. He built his house in the workers' suburb of Usovka and lived there with his wife Yevdokiya Ivanovna. Porfirii Alekseevich and Yevdokiya Ivanovna had six children, of whom Aleksandr was the youngest. He received seven years of education in his native town and then entered the Cherkasy Technical School for Road Construction. Here was accepted in the Komsomol communist youth organization. After successfully finishing his studies, Aleksandr was assigned to the city of Serpukhov on the Moscow district railway. In 1934 A. Marchenko was called up for active military duty. He returned to his native town of Glukhov with the three rank triangles on his collar tabs that at that time denoted an "assistant platoon leader." After a short period of rest with his family he started work in the Kiev Research and Development Office for Federal Transport Projects, under the People's Commissariat of Ways of Communications. After a while there came a lengthy tour of duty in Daghestan, and then in L'vov to inventory railway equipment. This is where he was when the war broke out. His office immediately recalled its employees to Kiev. Soon afterwards it was evacuated at full strength to the Urals. Marchenko was sent to the city of Magnitogorsk and made chief of a research group to realize an important railway branch. More than once Aleksandr appealed to the municipal military committee to send him to the front, but each time he received the polite answer: "Victory at the front is forged in the rear. For an artillery piece to fire upon the enemy, it must be made here, in the Urals." In February of 1943, when the whole world shook to the thunderous victory salvos of the great battles on the Volga, the workers of the Sverdlovsk, Chelyabinsk, and Perm districts petitioned the party's central committee to allow them to raise a tank unit with their own means have themselves sent to the front in these tanks to crush the fascist German invaders. The party's central committee approved this request. Soon the Chelyabinsk, Sverdlovsk, and Perm regional party committees in conjunction with the Ural Military District's military council set to forming units to make up a corps. Aleksandr Marchenko was one of the first to volunteer. This time, his application declared his resolve to "Be sent to a tank battalion." Thus he found himself in the recreation clubroom of the Chelyabinsk Factory's iron smelters, where courses were being conducted for gunner/radio operators. Everything was studied with diligence. Aleksandr finished the course near the top of his class and took his place as a gunner/radio operator in the crew of a T-34 tank that was christened with the threatening name of "Merciless" ["Besposhchadnyi"]. Once they were formed, the units of the newly raised volunteer organization received a number and the name of the place they were created. Thus, the 244th Tank Brigade to which Aleksandr Marchenko was assigned was named the Chelyabinsk, the 243rd the Perm, and the 197th the Sverdlovsk. When the organization was fully manned, the People's Commissariat of Defense gave it the title of "30th Ural Volunteer Tank Corps" ["30-i tankovyi Ural'skii Dobrovol'cheskii korpus"]. In the summer of 1943 the corps was concentrated in the forests surrounding the workers' settlement of Kubinka. This was 60 kilometers west of Moscow. The Ural men came under the 4th Tank Army. Now the units and subunits began to be trained to be a smoothly functioning military entity. The Komsomol crew of "Merciless" distinguished themselves on the maneuver grounds and firing range, and when the order came to deploy to the front it was already a tight-knit fighting team. Soon Marchenko's corps received its baptism of fire when it took part in the destruction of the Bolkhov group of enemy forces. There were many battles and engagements with the enemy. Orders and medals decorated the chests of all the crewmembers of the tank "Merciless." But the most valued reward of the Motherland for the Ural volunteers was the news that the corps and all its constituent units were given the title of Guards. The brigade that Aleksandr Marchenko was serving in was named the 63rd Chelyabinsk Guards Tank Brigade of the 10th Ural Volunteer Guards Tank Corps [63-i gvardeiskaya tankovaya Chelyabinskaya brigade 10-go gvardeiskogo tankovogo Ural'skogo Dobrovol'cheskogo korpusa]. To mark this event Guards Sergeant Major Aleksandr Marchenko and his soldier comrades decided to call their tank "Guards"["Gvardiya"] and wrote this glorious name on the turret. The next line on the map for the Ural tankers--through the ancient Ukrainian city of L'vov. The accompanying photograph was taken by Guards Lieutenant N.G. Chizh in June of 1944. It has a full right to be included among the unique photo documents of the Great Patriotic War. 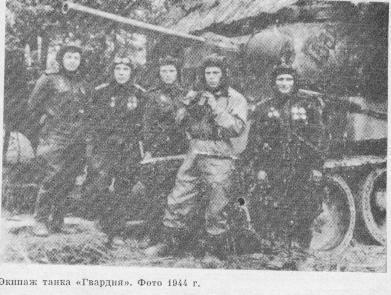 In front of the tank "Guards" is its crew: (from left to right) tank commander Guards Lieutenant Aleksandr Dodonov, gunner/radio operator Guards Sergeant Major Aleksandr Marchenko, gun commander Guards Senior Sergeant Nikolai Mel'nichenko, tank battalion commander Guards Captain Pavel Chirkov, and mechanic/driver Guards Senior Sergeant Fedor Surkov. The battalion commander was using this tank to go out on a reconnaissance. Just before the battle for L'vov Guards Sergeant Major A.P. Marchenko was appointed to an officer's position--adjutant to the battalion commander. His place in the tank crew was taken by Guards Sergeant Terent'ev. But Aleksandr Marchenko was not separated from his friends for long. Fate brought them together again on the night of 20/21 June 1944. In order to draw the enemy's attention from the brigade as it was preparing a frontal attack, the brigade commander decided to send a single tank with a load of automatic riflemen around the flank. At this time Marchenko's battalion was concentrated in the area around what is now Verkhne-Zelenaya Street, where is now located Friendship Stadium. The battalion commander's choice fell on the tank "Guards." Marchenko was named commander of the attack group, and this was not by chance. Had he not worked in L'vov before the war and know this area well? Unnoticed by the enemy, "Guards" made its way through gardens and vegetable plots to the area of the wooded park Pogulyanka. The sudden appearance of the Soviet soldiers in their rear caused a panic among the Germans and helped Guards Colonel Fomichev's tank battalions successfully break through the enemy defenses. By 23 July, the 63rd Chelyabinsk Guards Tank Brigade had already liberated a significant part of the city. The brigade headquarters and its rear support units, including the medical battalion, were spread out on Kokhanovskaya Street (now Mayakovskaya). At about 12 o'clock "Guards" broke through to the city municipal building (now the headquarters of the executive committee of the L'vov Council of Workers' Deputies). Colonel Fomichev had personally handed Aleksandr Marchenko a red flag and ordered him to erect it on the municipal building's tower. Now came the moment to carry out the brigade commander's orders. Mechanic/driver Fedor Surkov brought the tank right up to the main entrance, and Nikolai Mel'nichenko traversed the gun so that it could instantly open fire. Accompanied by the automatic riflemen, Marchenko stormed into the building. In an instant the municipal building's defense was eliminated. The lobby on the third floor. The door to the tower. Marchenko climbed up the stairs. A pistol shot at the observer making artillery corrections. It was only the work of a few moments to rip down the fascist rag and fasten the red flag to the pole. At last the scarlet flag of the land of Soviets flew over the spire of the tower. On leaving the building, Aleksandr Marchenko was seriously wounded by a burst of automatic fire from a window of the adjacent house. Three bullets entered his chest. The battalion medical instructor, Konstantin Rozhdestvenskii, hurried to help him, but he too fell, killed by fascist automatic fire. Nikolai Mel'nichenko traversed the tank gun and sent a shell into the window from which fire was coming. His friends carefully laid Aleksandr Marchenko and Konstantin Rozhdestvenskii onto the tank turret and carried them to the medical battalion. The Germans, upon seeing the red flag on the city hall's tower, began firing on the city center from an armored train positioned on the approaches to the train station and from guns emplaced on Knyazhnyaya Hill and around Lychakovskii Park. Aleksandr Marchenko was mortally wounded in the head by a shell fragment when a round impacted beside the tank. He died in the arms of his friend Fedor Surkov. The tankers buried their comrades next to the medical battalion, stood silently alongside the grave--and went again into battle. For six days the crew of "Guards" fought in the streets of L'vov. During this time they eliminated over a hundred enemy soldiers and officers and destroyed eight tanks. But they themselves did not escape unscathed. On 26 July on the approaches to the High Castle, where there was one of the last centers of German resistance, a direct hit from a panzerfaust put the tank out of action. Guards Lieutenant Dodonov and Guards Sergeant Terent'ev were killed, and N. Mel'nichenko and F. Surkov wounded. Guards Sergeant Major Fedor Pavlovich Surkov, as well as the commander of the 63rd Chelyabinsk Guards Tank Brigade, Guards Colonel Mikhail Grigor'evich Fomichev, were made Heroes of the Soviet Union for the heroism displayed during the liberation of L'vov. For his actions, Guards Sergeant Major Aleksandr Porfir'evich Marchenko was posthumously awarded the Order of the Patriotic War 1st class, which now lies in the L'vov Historical Museum. After the war the remains of A.P. Marchenko were transferred to Lychakovskoe Cemetery and later to the Hill of Glory, to the communal grave of the tankers who perished in the battles to liberate L'vov. On the side of the headquarters building of the Municipal Council of Workers' Deputies there was placed a memorial plaque telling of this brave soldier's deeds. As indicated in a report by the L'vov Regional Military Committee, the remains of 18 soldiers rest in the tankers' communal grave. Who else besides A.P. Marchenko lies buried here? Retired Lieutenant Colonel N.A. 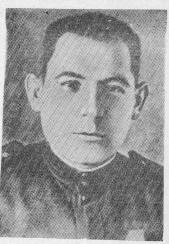 Yemel'yanov managed to establish the names of three soldiers. These are the commander of the tank "Guards" Guards Lieutenant Aleksandr Vasil'evich Dodonov, gunner/radio operator Guards Sergeant Terent'ev, and medical instructor of the 2nd Battalion of the 63rd Chelyabinsk Guards Tank Brigade Guards Junior Sergeant Konstantin Ivanovich Rozhdestvenskii. After the war, architect Afanas'ev designed a monument to the tanker heroes that was erected on Lenin Street: a tank on a high pedestal. The front edge of pedestal is adorned with the insignia of the Soviet guards. On the sides--memorial plaques on which are inscribed the names of the soldiers who gave their lives to liberate the people of L'vov. Among them is the name of Guards Sergeant Major A.P. Marchenko. The glorious name of honorary citizen of the city of L'vov, hero-tanker Aleksandr Porfir'evich Marchenko, entered into the history of our city for all time.